We’ve got birthday parties down to a science! Interested in having an unforgettable STEAM birthday party that captivates your child? Children 4 years old and older LOVE celebrating with SciTech Kids! We offer fantastic parties that include science experiments or tech activities that are interactive, exciting, and educational. Children become budding scientists, engineers or designers as they perform cool, activities and enjoy incredible special effects that thrill and inform young minds! Our 2,000 square foot facility can accommodate up to 40 children. Reserve your date today! Call (212) 804-7055 for more information! We offer four party packages and a variety of birthday party themes to suit your child’s interest. Have a question? Please give us a call at (212) 804-7055 for more information! Looking for SciTech Kids to enliven your party or special event? We travel! 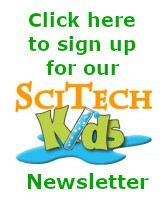 Ask us about SciTech Kids On The Go! Our 90-minute Bouncing Bubbles Dance Party combines what kids love most: bubbles and dancing. Budding chemists enter our decorated Science laboratory filled with beakers, flasks, test tubes, test tube racks and graduated cylinders! Watch how engaged the kids become as they individually conduct cool, hands-on science experiments including making a bubbling lava lamp in a test tube. Learn how to make slime, a non-Newtonian fluid, as we mix different solutions and understand the science behind these speculator activities. Big Bang Package: $1,595 (each additional child $55.) 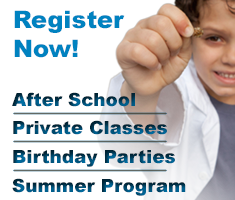 Dry ice, Lab coats & Goggles rentals are included! Your child will have the ultimate Hogwarts experience. Guests journey to the magical platform 9¾ to attend potions class and are spell-bound as the want chooses the wizard. Based on the Harry Potter series, young wizards make potions that bubble, glow or change color. The grand finale; our Professor instructs wizards to wave their wands as they create a massive, foggy bubble in a cauldron and watch the bubble disappear in thin air! Wizards have a magical experience in the world of Harry Potter and are so proud of their concoctions that they make a toast to the birthday child as they sip a fuzzy, bubbly Hogwarts drink. Nova Package: $1,350 (Each additional child $52) Dry ice and Wands included! Big Bang Package: $1,650 (Each additional child $55.) Dry ice and Wands included! Welcome to the Star Wars Jedi Academy! Kids attend Jedi training and learn Jedi moves from a Jedi Master as they use a lightsaber. Once dubbed real Jedi Knights they conduct two science activities inspired by scenes in the Star Wars movies. The party ends with the Jedi Knights recreating a special crystal ball and toasting the birthday child. Nova Package: $1,350 (Each additional child $52) Dry ice and Lightsabers included! Big Bang Package: $1,650 (Each additional child $55.) Dry ice and Lightsabers included! Get illuminated! Kids of all ages love assembling necklaces, bracelets, and beads that glow in the dark under black lights. Then they create amazing glow-in-the-dark t-shirts or hats using UV markers. Next, kids experiment with glow-in-the-dark slime. They then hit the dance floor and are all aglow are ready to glow as they dance on our glow in the dark dance party floor. Guests do dance games such as freeze dance and limbo as they flash their mini blacklights under spectacular large black lights that set the room aglow. Nova Package: $1,450 (Each additional child $52) Mini blacklight included for each child! Big Bang Package: $1,750 (Each additional child $55) Mini blacklight included for each child! Making slime is so popular these days! Get messy making slime which is a cool chemistry activity. But did you know that slime is an example of a non-Newtonian liquid? Kids of all ages are fascinated by the many different types of slime we make in our lab. You can’t go wrong when you design your own selection of slimes: fluffy slime, butter slime, glow-in-the-dark slime, and edible slime. We even have glow in the dark slime! Atom Package $1,095 (Each additional child $45) Slime included! Nova Package: $1,250 (Each additional child $52.) Slime included! Big Bang Package: $1,550 (Each additional child $55) Slime and lab coats included! Our Magical Unicorn Party (or Mermaid) gives children the chance to be as sparkling and magical as they want to be. Children will perform activities ranging from designing their very own Unicorn tote bag, Unicorn horns, t-shirts, or jewelry box and make their very own colorful Unicorn slime. Kids love realizing the power of the Unicorn. Children become paleontologists and learn the history of dinosaurs as they begin to dig for fossils. After their dig, they will play Pin the Tail on the Dinosaur. They also scientifically dissolve dinosaur shells with hidden baby dinosaurs. At the end of the party, each child will be an official paleontologist and receive a certificate stating they completed the dinosaur dig. Nova Package includes: $1,295 (each additional child $52) Plush Dinosaur tails included! Who doesn’t love a spa party? Relax as your kids spend two hours making fizzy bath bombs, customized, lush soaps or scrubs and learn the science behind combining natural ingredients. These spa scientists will even choose what fragrance they’d like to add to their creative concoctions. Best of all, they take them home to pamper themselves for the rest of the day. Nova Package includes: $1,095 (each additional child $52) Spa creations and special treats included! Big Bang Package $1,250 (Each additional child $55) Spa creations and special treats included! SciTech Kids Lego Skyscraper Party gives young builders the chance to learn about New York City and engineering as they build a Skyscraper out of Legos. Kids have a blast incorporating life-size Legos and LEDs, in their urban planning design. For the Big Bang Package for kids 7 and up, after the Skyscrapers are complete, the kids will be able to race along the crowded streets, by building a robot using an Ev3 Robot from Lego Mindstorms. Nova Package: $1,250 (each additional child $45.) Legos included! Big Bang Package $1,550 ( Each additional child $59.) Legos included! Does your child love superheroes? Then keep their wheels turning with these science experiments inspired by their favorite heroic characters. If they love Aquaman, then let’s make an ocean in a bottle or a leak-proof bag experiment. Alternatively, make magnetic slime and use a Megamagnet for lovers of Iron Man. If your child loves Superman, then he or she will enjoy the strength balance experiment or make paper airplanes. Explore the power of super stretchiness, Mr. Fantastic, and make glow in the dark slime. Whatever superhero(es) you choose this party will be a blast! Nova Package: $1,250 (each additional child $52) Capes included! Learn the science behind skateboards! Kids learn how to design their very own wooden skateboard and the science behind how it moves and not falling off. Don’t be surprised if our SciTech Kids skater shows you a lesson or two on how to ride a skateboard in our space. Nova Package: $1,395 (Each additional child $59) Wooden Skateboard included! If you have a particular science or Tech theme in mind, let us know, We can customize a dream party for you. For example, For a Despicable Me party, we created a top-secret PX lab that produces the PX-41 potion, the mutagen that turns living things into indestructible killing machines. Let us arrange a science party your child will NEVER forget! In the past, our party themes have included: Design Your Own Video Game, Minecraft, CSI, and Pokemon. Contact us to today for details and pricing. Looking for the right party for your special needs child? Let us know! From visual schedules to creating a space for those who need a break, we believe all kids should have a birthday party to remember! Need MORE science or wizardry? Customize your birthday party with special add-ons that will amaze your guests. Lab Coat and Goggle Rental: Do you want to inspire kids to be budding scientists? Add lab coats ($5/child) and goggles ($2/child) to your package. Goody Bags: Have your goody bags match the theme of your party which will include 3 items. ($10/each). Photos & Props: Party guests can have their picture taken with fun props. ($125). Additional Party Space: Reserve the front space of our facility for private and large parties. ($400) The front space area must be reserved for non-drop-off parties with greater than 20 kids. Reserve our outdoor space for private parties for $500. Alcohol: There is a $50 fee for liquor brought to a party.